​Feeling the chill? 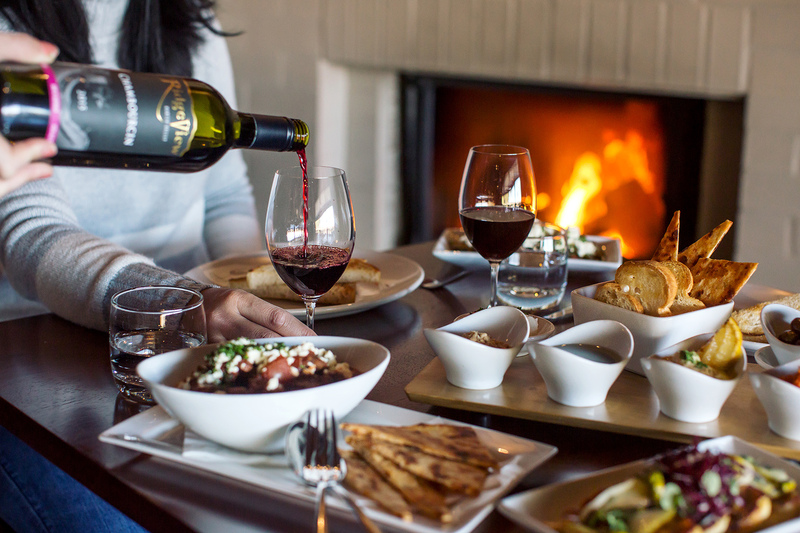 Here's the inside scoop on the best spots to dine by a fireplace in the Hunter Valley (with a glass of red in hand). RidgeView Restaurant Executive Chef Donna Hollis and her team use fresh local produce to create their seasonal menu whilst their organic vegetable garden is tendered daily to supplement the fresh produce for their Mediterranean and Middle Eastern inspired menu. Warm up by their cosy wood fire for dinner. (Pictured above). A stunning bar designed by renowned interior designer Greg Natale. Sit by the open fire and 'wine down' after a day of exploring the Hunter Valley in Epoche Bar. The bar offers light meals to accompany a glass of local wine, craft beer or a cocktail. Located within the grounds of Estate Tuscany, Executive Chef Daniel Wijekoon sources local produce to create a spectacular modern menu at The Mill Restaurant. A fine dining experience with picturesque views of the Brokenback ranges. ​A soaring space with a large stone fireplace stocked with iron bark timber, the two-hat Muse Restaurant is located in the iconic Hungerford Hill winery. Troy Rhodes-Brown's Modern Australian dishes showcases Hunter Valley produce with an emphasis on seasonality and quality. Set within the grounds of Adina Vineyards and Olive Grove in Lovedale, Emerson's offer an intimate and relaxed dining experience and are committed to producing elegant dishes using locally sourced, fresh produce. Feast on their popular eight course degustation dinner, matched with local Hunter Valley wines or settle in for a relaxed weekend breakfast or long lunch. Centrally located in Pokolbin and a short stroll from Hunter Valley Gardens is The Cellar Restaurant. Chef Andy Wright's rustic Mediterranean inspired cuisine can be enjoyed in a sophisticated, yet relaxed environment. Warm up next to the fireplace set right in the middle of the restaurant. Soak up the charm of this sandstone building and warm up next to Cafe Enzo's Victorian fireplace. Offering delicious local eats and treats including Campos coffee, it's the perfect spot for a relaxed breakfast or lunch. ​This charming restaurant is perched on a hill with views from every table. At Amanda's on the Edge they don't over complicate the food, just nice hearty meals to enjoy fireside. Nothing beats a rustic Irish pub with a Beef & Guinness Pot Pie and a pint of beer. Harrigan's offers a relaxed, family friendly bistro with casual pub eats. Discover more local Hunter Valley eats here.